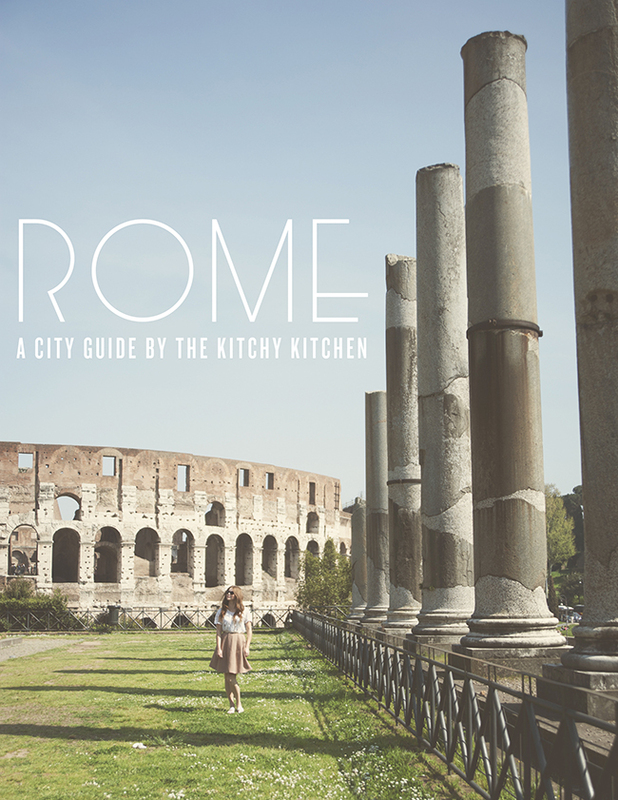 Want Claire’s entire guide to Rome? Check out her PDF! Comfy Shoes: You will be walking over cobble stone streets and ruins – do not wear heels! I wore comfortable sandals and sneakers. Band Aids: See above. In case you didn’t heed my warning, bring band aids for back up. Cash: Most places take credit cards, but it’s a 50/50 shot for cafes and gelaterias. Hand Sanitizer: There are a lot of people, touching a lot of things, all day. Rome also doesn’t have a rep for being the cleanest Italian city from a municipal point of view. A Book: Who am I kidding? 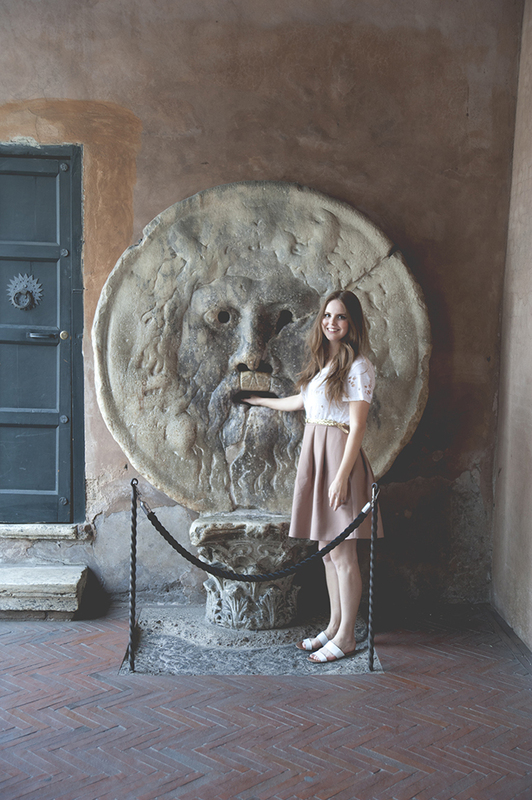 You’ll be too busy reenacting your own version of Roman Holiday. But if you do find some time, make sure to hang out in one of Rome’s innumerable coffee shops to people watch and read. High Waisted jeans: To hide the muffin top you’re going to get from eating a boat load of pasta. Most cities get about 5 major tourist attractions – Rome has at least quadruple that, plus the food, the shopping, all of the smaller scale monuments, and the neighborhoods as well. It’s overwhelming, how much there is to see. And you have to cut through thousands of people aggressively wanting to see the same things as you. As a history nerd, you’d think I’d get historical FOMO, anxiety that I need “see it all” or else I’m somehow not doing Rome right. I actually have the opposite reaction. Oh, another world class monument? Shoulder shrug. It’s not that I’m jaded to historical wonders, it’s that I hate check mark tourism. Historical sites are not Pokemon characters – gotta catch them all! And honestly, they mean very little to you if you don’t understand the context, people, or story of why they’re significant. So in Rome, create a shortlist of what you care about, and stick to that. You’ll probably walk by most of the other guide book stuff anyway. You’re not going to get to it all, and anyway, who wants to run around when there’s so much pasta and pizza to eat? What’s the perfect amount of time in Rome? You could easily spend six months in Rome, there’s so much to do and see, but if you’re planning a European vacation, I’d give it at least 3 days. You’ll need one day for the Vatican, one day for the Colosseum, Palantine, etc., and one day to hang out in the less touristy part of town. Rome at night. If you can, spend your first night walking through the city center. It’s so much quieter and less rushed. There are no lines, and every famous landmark is lit up beautifully. If you’re trying to hit a checklist, it’s hard to beat this method. Plus, you’ll probably walk past all of these spots on your way to dinner anyway, so why not make it a purposeful adventure. And if it’s an especially fun evening, you might end up dancing in the Trevi Fountain, ala Anita Ekberg. Show up an hour earlier than you think reasonable for stuff you REALLY want to see. This is especially true for the Sistine Chapel, which was a nightmare. The website states that the museum closes at 4pm, but the last tour group is 3pm. So I ended up running up the hill from the bottom of the basilica – in motorcycle boots – to make it before the doors shut. Not my finest moment. Additionally, the lines can get crazy long, so just add a silly amount of buffer. The good news is that if things move a little quicker, you’re in Rome! You’ll have plenty of other fabulous things to do and see. The street numbers are…vague. They’re never totally wrong, but more of a “It should be on this block” situation. If you can’t find what you’re looking for, go up or down a few doorways. Gelaterias only offer one sample – if that – so coordinate your tastes wisely! It’s hard to have a bad gelato or espresso or pizza …but on the flip side finding the truly special and spectacular requires a bit of searching. Do a bit of research and go where the locals go, rather than just where the concierge recommends. The Trastevere neighborhood was the area my hippest friends kept referencing. It’s quiet, tucked away from the throngs of tourists, and filled with amazing food and locals on bicycles. Le Mani Pasta is one of the must try restaurants in the city, and while yes, the fresh, handmade pasta is amazing, it’s more about the ingredients than the technique. This is true for all Italian food, which is minimalist at its best. The prosciutto and melon may sound “meh,” but if ordered at the peak of the season, it’s a revelation. If white truffles are in season, get the pasta with them. Also located in charming Trastevere, Da Enzo is one of those spots that is CRAZY popular but actually good. The decor is humble, but it’s so full with people it’s impossible to tell. 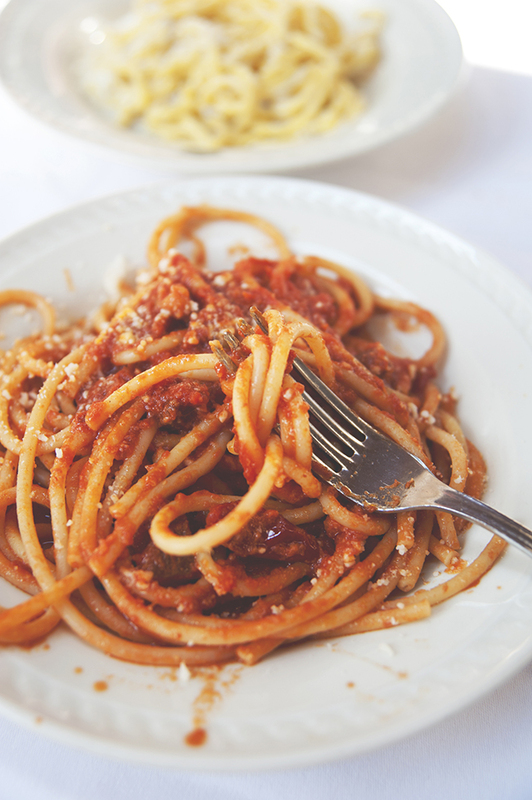 If you want simple Roman cuisine done beautifully, it’s hard to imagine finding better. Order one of the four Roman pastas, the fried artichokes, and the zucchini flowers. There will be a wait, so make a reservation. If you’re looking for classic Roman pizza, a little charred and super thin, this is your spot. It’s in a sort of random part of town – not near any main attractions and on a quiet street, but it’s worth the trip. Their panna cotta and appetizers (like salt cod) are also delicious. A quick note: we walked an extra 30 minutes out of the way to go here, and it was closed. Even though it was during their posted business hours, and it wasn’t a holiday. Call ahead to make sure. I love the street this little sandwich shop is on! It’s across from a cute boutique, close to the Colosseum, and has the TINIEST sandwiches. You can order the large, which is a regular sized panino, or you can get the small, which are the size of sliders. We got a bunch of sliders so we could try the different combos. The Peggy Rockefeller, with prosciutto, zucchini, and a Parmesan crisp, and the Amber queen with cooked ham, eggplant, and taleggio were our favorites. A charming little bistro with a chef inspired by the past, l’arcangelo is a great first meal to have in Rome. Inspired by his home town and its history, chef arcangelo uses ancient techniques and inspiration for his seasonal dishes. The space is bright (not the most romantic) and inexplicably has little hot wheels on every table instead of flowers or candles. My husband loved this, mostly because he recognized a hot wheels he used to have on our table. Amazing carrot puree amuse Bouche. I had no idea a puree could be so velvety. The best bite was the gnocchi, and the menu is always changing. Delicious and inexpensive thin crust pizza joint for a faster lunch. Make sure you get a pizza with an egg on it and the zucchini blossom. Trust me! A wonderful white cloth dining experience located in an exquisite boutique hotel. Great service, delicious and accessible molecular gastronomy cuisine, and a fantastic wine list. Skip ordering dessert – you’ll get an entire dessert course of macaron and petit fours included in the meal. 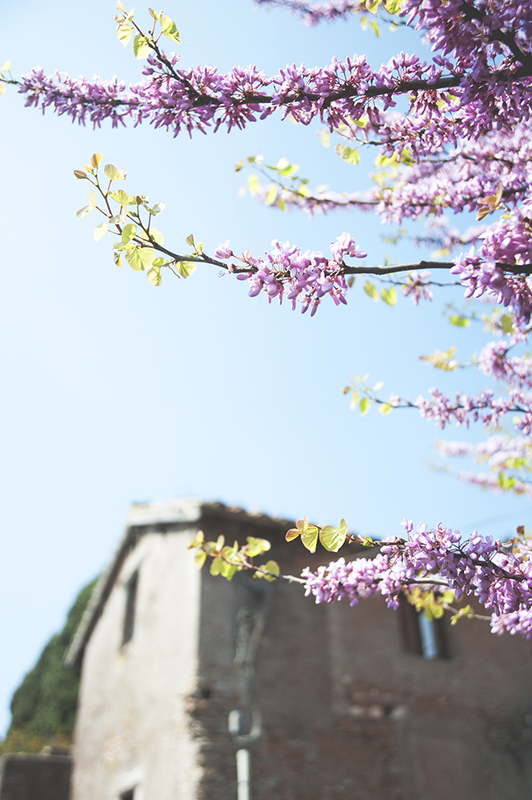 If you make an early reservation, you can walk through the Borghese park at sunset to get to the restaurant. Definitely pricey – but worth the trip if you’re celebrating a special occasion. Located in a charming street in the former Jewish ghetto, you can’t miss da giggetto because of the giant tower of artichokes out front. You can’t miss Da Giggetto because of the giant tower of artichokes at the door. Located on a Roman charming street in the former Jewish ghetto, this is the place for Carciofi alla Giudea – crisp on the outside, meltingly tender in the middle, pressed flower looking artichokes. It’s a local specialty, and so delicious. Order the fried artichokes, and then one of the four major roman pastas, and enjoy the view of the ruins out front. Our best meal in Rome. It’s a local spot that has been there since 1936, and the tiramisu is unlike any other I’ve had before. It flipped my husband into a Tiramisu lover. They have the classic roman pastas, but order the Abbacchio al Forno. It’s roasted lamb with crispy potatoes, and here’s the thing – even if lamb isn’t your favorite, get it. It’s fantastic and not very gamey at all. An absolute MUST. One of the highlights of our entire trip. Just get a box and try whatever looks good. The pistachio profiteroles and the perfect scoop of pastry cream dotted with wild strawberries in a delicate crust were unreal. We bought an enormous amount of goodies and snacked on them all day. Cannoli, anyone? I don’t know why Siciliy is THE region for Italian sweets, but it simply is. 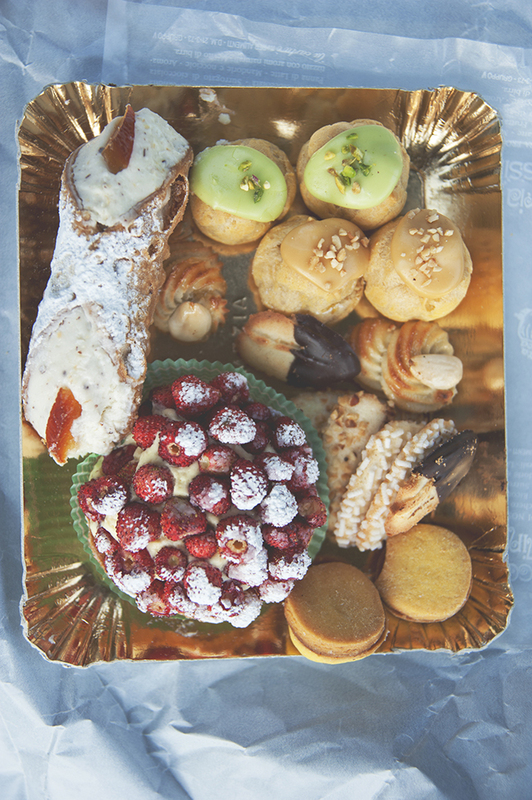 All of the best pastry shops are Sicilian, or at least carry a wide array of Sicilian treats. For one of the best cannolis ever (get the pistachio one), load up here. the unpasteurized cream adds a richness and depth that is unreal. In the same location since 1946, this spot is famous for it’s granita di caffe` con panna, which is shaved iced coffee topped with fresh whipped cream. On a hot Roman day, it is the ONLY option. Not to be missed Caffe` Greco, just in front the Spanish Steps, has been at the same location since 1760, . It is a centuries-old coffee house where Lord Byron and Goethe had coffee and also where Richard Wagner and Franz Liszt met for pastries. Its labyrinthine room conjures up images of the past and the people that used to come here. Inside the touristy gelato shop (it’s not bad, just a bit crowded) you’ll find Bartini, a classic Sicilian pastry and candy shop. I loaded up on the pate de fruit, marzipan, and Cassata Siciliana (that bright green cake made of marzipan, candied fruit and ricotta). I loooooove this gelateria. Definitely the best flavor intensity and consistency of the whole trip. It’s located in a quieter part of town, more popular with the locals, but the flavors are so unpretentious and good. Get the Crema 1947, the original gelato recipe from when the gelateria first opened. It’s a rich vanilla custard scented with lemon zest, and just divine. This definitely one of the best gelaterias in town, and it’s unsurprising as to why. Fiori di Luna aggressively pursues using the best, freshest ingredients, and making gelato in small daily batches. It’s a simple philosophy, but it works. Any nut or fruit gelato is a great choice here, as the nuts are freshly stone ground for the gelato, and the fruit is cooled as quickly as possible to prevent oxidation. This gelateria had my favorite selection of flavors, but served scoops in cups only, and a begrudgingly given single tastes – like, a lot of attitude about it. The honey flavor was very buttery, but not too sweet and the torrone (nougat) with a touch of rose was lovely too. It was also the most expensive gelato on the trip, by at least a euro. I am SO BASIC for even including this in the land of perfect gelato, but hear me out. They hand dip the magnums for you, and you can do whatever topping you like. We did sea salt and chili flake with dark chocolate, and it was heavenly. Ok, that is all, return to your other gelato eating. The “Pro fuvum Roma” sign in the front of the store caught my eye as we were walking by. As someone who loves sniffing every candle and applying every lotion, I had to go in. Durante carries a wide variety of perfumes and scents, but the Profuvum Roma was my focus here. The line is made up of modern, clean, Roman inspired scents. Some are focussed on one note, like NEROLI, but my favorites are the more complex perfumes like ROSAE MVNDI – roses layered with patchouli, cedarwood, and vetiver. I love this soft, minimalist space – it’s the perfect spot to search through racks of Chloé, Missoni, Alberta Ferretti, and Anya Hindmarch. The shop is owned by fashion designers Josephine de Huertas and Mauro Crachi, who hand-pick the beautiful wares, and around the corner is Josephine de Huertas Enfant, their children’s store concept – which is just as dreamy as the main store. If you want classic, simple Italian style, Marella is a good pick. It’s unfussy and filled with wardrobe staples. I feel like you HAVE to have a notebook in Italy, right? So pop in here and grab a stack of them. Give yourself some time though, you’ll definitely get lost in the shelves. Imagine if Isabel Marant and Rachel Comey had a fashion baby. This Spanish line is filled with boho texture and hipster structure – basically a dream. You can’t go shopping in Rome and ignore the amazing modern Italian design. Pop into Dolmen factory to scope out chic furniture and maybe pick up some coasters to take home. 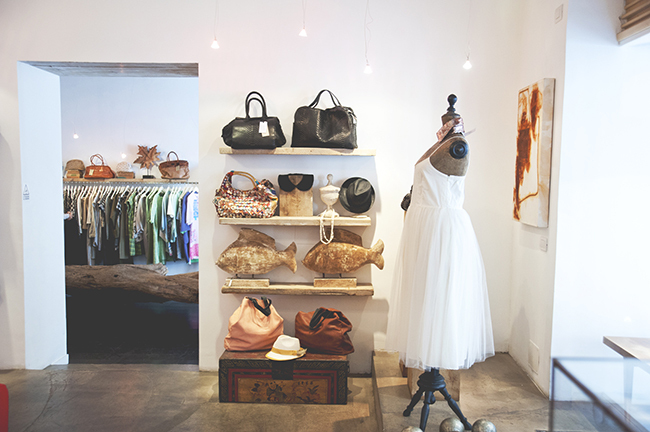 This chic store is filled with looks by high end, local designers. There are two storefronts in the same building, one is more casual with a wall of cozy knit sweaters, bohemian jewelry and low key shoes and the other features more formal pieces like silk dresses and furs. Apparently the best dressed segment of the population are children, because the children’s stores in Rome are just adorable. The entry is around the corner and up the hill from the basilica. That long line in the piazza is for the dome – not the sistine chapel (I found this out the hard way). We took the short tour, which amounts to a forced walk through of 40 or so miniature exhibits collected thematically. Among the worst spots we’ve visited in terms of crowd behavior and people behavior, but the Sistine chapel itself was breathtaking. Read up a bit on the history and content of the painting beforehand – it will enrich your experience of the Sistine chapel in particular. It’s hard to feel smaller than when you’re standing in the middle of the piazza, looking at the dome. The piazza is free to stroll through, but mind, the line to go into the basilica is GIANT. Like…an hour. I’m not saying it’s not worth it. I’m just saying I wish they had a video camera set up like Shake Shack in New York, where you can check in online to see how crazy it is. If you can, go very early, and go with a buddy. Take turns getting gelato and snacks while the other waits in line. It’s hard to believe this structure is almost 2000 years old. It’s massive, in the middle of everything, and walking into the center during the day is pretty amazing – it’s surprisingly filled with light for a windowless space. What’s great is that it takes about 10 minutes to walk around and take in, making it the perfect stop while you’re exploring the city center. The Palatine hill is the literal heart of Rome – mythologically, it was where Romulus and Remus were taken in by a she-wolf. I would vote to skip the Colosseum and its insane lines, but do the Palatine hill, where you get a gorgeous view of the Colosseum. Comparing the Palatine to the Pantheon is interesting, because the Palatine truly is a ruin. Because the Palatine is a large series of palaces and municipal buildings overlooking Rome, rather than a single edifice, it was the ideal spot for medieval churches to build. The views are gorgeous, and it’s a wonderful way to spend the afternoon. 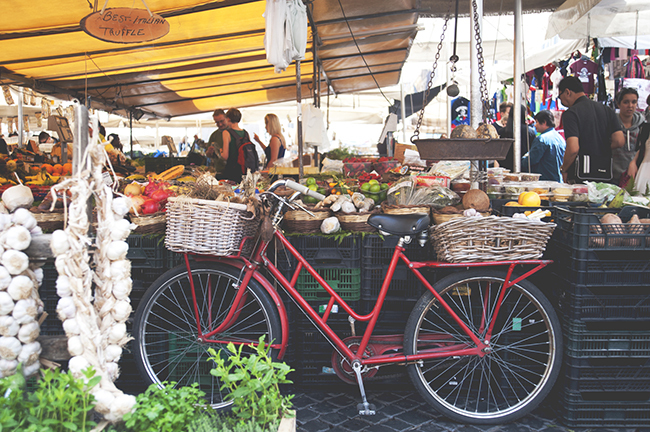 Imagine the dreamiest farmer’s market. Great, so, that’s the Campo di Fiori. There were more varieties of spices and sun dried tomatoes than I knew what to do with. The flower and farmer’s market in Campo de’ Fiori is one of the oldest in Rome; it has taken place every morning since 1869. Stock up on sun dried tomatoes, fresh citrus, and the abundance of gorgeous produce. Skip the pre-made spice blends, though. Villa Borghese is the only museum I’ve heard of that requires a reservation at least two weeks out. It’s crazy. But the collection is fantastic, and definitely worth it. The park surrounding the Villa is beautiful, but unkempt, so maybe skip the sandals when you go for a stroll.